“You’re good at this, but I am not creative…. Here is a perfect example of how I do it. As I walked through the store, two of the many voices in my head began to talk at once. One was bitching and moaning about the fact that Christmas isn’t even here yet and there is V-Day stuff around. The other voice was reminding me that I don’t need anymore Christmas decor, and that I should focus on the errand at hand…. But it doesn’t hurt to look, right? Ta-Da! 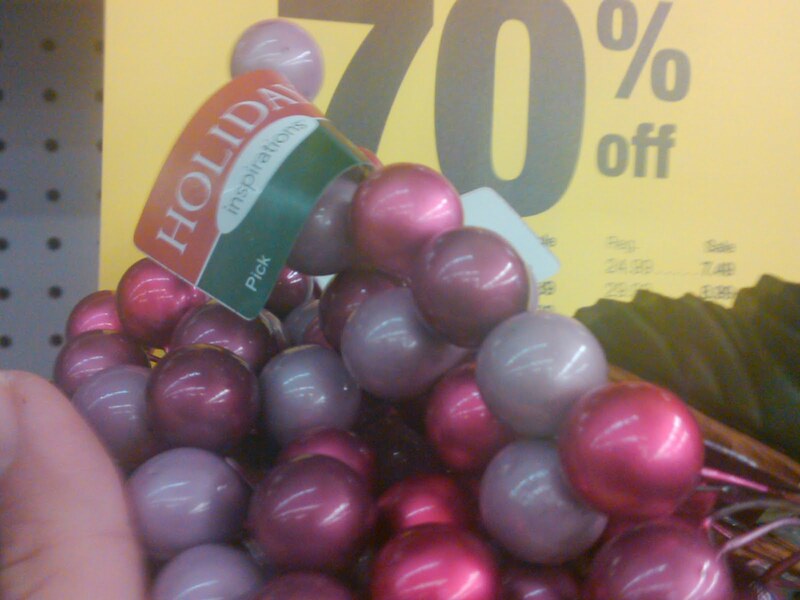 Quicker than you can say plan ahead, I found pink “Christmas” berries for 29 cents a piece. Pink reads Valentine’s Day to me. I bought the supplies for what will be a Valentine’s wreath, on clearance, 2 months before Valentine’s Day. For me, much of my creativity springs from trying to be economical. Try looking at something that is an amazing deal, but try to imagine it as having a different purpose. Failing that, it’s never too early to start shopping for next Christmas. I was just thinking I need to see if I can find some deals for next year…but valentine deals are even better! I was at Target today and saw a whole endcap display of Vday stuff. I’m always in too much of a hurry to stop and look around for potential ideas. I run in, get what’s on the list and get out. One day I’m going to grow up, not be running late for everything and find deals like you! Always love the deal and the thinking ahead. The day after Christmas is a wonderufl time for deals for next year, even for gifts. I love it – Valentine’s Day BEFORE Christmas…you are so smart…and economical…. When I grow up, I wanna be just like you. I’ll give this a try. I’ll let you know how it goes. This is what a present from Santa should look like. Some Christmas decor works for Valentine’s Day.